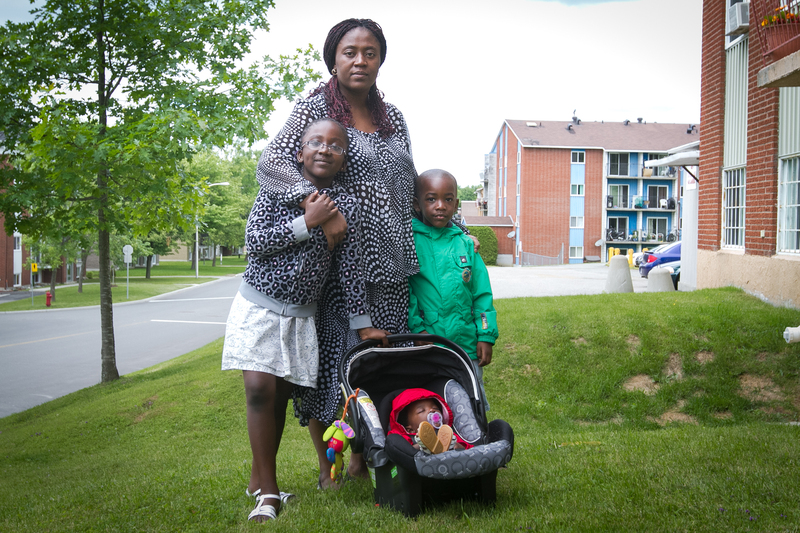 (June 29, 2014) Solidarity Across Borders is urging support for the Pika Family of Sherbrooke in their attempt to remain united together in Quebec, where they have lived for five years. Sarah Maggali, the mother of the family, along with their eldest daughter, Kezia Hope (7 years old) are facing removal to the Republic of the Congo on July 4, 2014 (in less than one week!). They will be separated from Pacôme Pika, the father of the family and a graduate student, as well as the two youngest children who were born in Canada: Keren Elicha (3 year old son) and Khelen Mercy (5 month old daughter).The deportation order is based primarily on two factors: i) the failure to pay an administration fee for re-establishing Sarah Maggali’s status during a period of time, during the student strike, when Mr. Pika was unable to obtain a bursary; ii) discrimination by an immigration agent against Sarah Maggali due to her diabetes. Neither of these factors should result in the separation of a family, particularly the separation of a young mother from her small children, including a 5 month infant, and the separation of a daughter from her father. This is an urgent situation. We urge supporters of Solidarity Across Borders to write two separate letters: one letter to the federal Ministers of Immigration (Chris Alexander) and Public Safety(Steven Blaney) and a second letter to the Quebec Minister of Immigration (Kathleen Weil). Your letter to the federal ministers should urge them to stop the deportation of Sarah Maggali and Kezia, and allow them to stay in Canada with the rest of their family. Your letter to the Quebec Minister of Immigration should urge her to personally intervene in this file and to grant Sarah Maggali a Certificat de sélection du Québec (CSQ) as someone who has been settled in Quebec for five years. We would encourage you to also phone each of the three Ministers as well. Contact information is included below. The full names of Sarah Maggali and Kezia are: Sarah Maggali Namoutiri and Kezia Hope Pika. Please contact solidaritesansfrontieres@gmail.com to let us know that you’ve written letters and/or phoned the Ministers. Thank you for your solidarity and support for the Pika Family. i) CONTACT Minister of Immigration Chris Alexander and Minister of Public Safety Steven Blaney together and urge them to cancel the deportation order against Sarah Maggali Namoutiri and her daughter Kezia Hope Pika. ii) CONTACT Quebec Minister of Immigration, Kathleen Weil and ask her to personally intervene in this case and to grant Sarah Maggali Namoutiri and Kezia Hope Pika a Certificat de sélection du Québec (CSQ).